The 35th Infantry Regiment Association salutes our fallen brother, CPL Keith Emerson Bennett, RA17282728, who died in the service of his country on October 11th, 1951 in North Korea. The cause of death was listed as Satchel Charge. At the time of his death Keith was 18 years of age. He was from Eagleville, Missouri. Keith's Military Occupation Specialty was 4745-Light Weapons Infantryman. The decorations earned by CPL Keith Emerson Bennett include: the Combat Infantryman Badge, the Silver Star, the Purple Heart, the National Defense Service Medal, the Korean Service Medal, the United Nations Korea Service Medal, and the Republic of Korea War Service Medal. 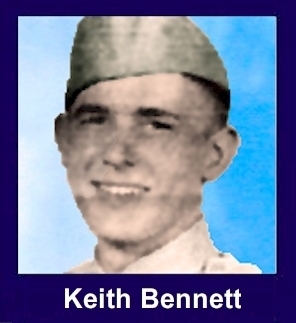 Corporal Bennett was a member of Company B, 1st Battalion, 35th Infantry Regiment, 25th Infantry Division. On October 11, 1951, he was leading a combat patrol in an assault of heavily fortified enemy positions on "Sniper Ridge" near Kumhwa, North Korea. Repeatedly exposing himself to enemy fire, he successfully led his patrol in the assault and assisting his wounded comrades, until he was killed by an explosion of an enemy satchel charge. For his leadership and valor, Corporal Bennett was awarded the Silver Star, the Purple Heart, the Combat Infantryman's Badge, the Korean Service Medal, the United Nations Service Medal, the National Defense Service Medal, the Korean Presidential Unit Citation and the Republic of Korea War Service Medal.